The ability to perform a three-finger drag gesture on Mac and MacBook trackpads allows users to move windows and items on screen with a gesture rather than the usual click and drag, this feature is well liked by many Mac users and has been in OS X for quite some time. 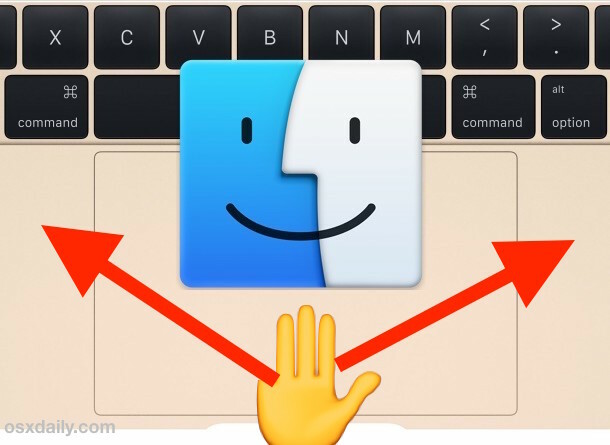 Once residing in the normal Trackpad settings of System Preferences, the latest versions of OS X (El Yosemite and Capitan 10.11 and newer) has moved the dragging gesture settings for Trackpad elsewhere though, and so if you want to enable this feature or just try it out on your own Mac you’ll need to dig a little deeper than usual through the system settings. Three finger drag is quite literal, meaning you hover the cursor over a window title bar and place three fingers on the trackpad surface and drag them around to move the window, no clicking or pressing down on the trackpad surface is required. While you’re in that settings screen you may also want to adjust the scrolling speed of the trackpad, which is also in the Accessibility portion of Trackpad options. This feature works with a Magic Trackpad, 3D Touch Trackpad (the same thing as Force Touch), and standard multitouch trackpads built into any MacBook, MacBook Air, and MacBook Pro. Once enabled it should work flawlessly, though every once in a while you may encounter issues with dragging which requires specific troubleshooting methods to resolve. Thanks to iDownloadblog for the reminder about where this feature relocated to, it’s one of those gestures you either love to use with the Mac trackpad or hate, but regardless it’s welcome to recall exactly where the settings option is located in OS X.
I know, like, right. I was really digging El Capitan, until I couldn’t find the 3 finger drag. Now, all is right in the world. But, I mean, seriously, 3 finger ain’t under the trackpad system panel?! WTHey… Apple, please don’t move the most important feature of the trackpad ever again. To bad it’s not in Mavericks. Still, good tip. This feature IS in Mavericks. Enable it in trackpad control panel instead. I’ve had mine set up “without drag lock” for a long time. I just use my index finger to do quick light double tap and then move my finger on the trackpad to wherever I want my file placed. Love this feature. A few OS X releases back I used to have both gestures enabled. I used to love it because I preferred to use the double tap when lets say I wanted to select text and the three finger gesture when I wanted to quickly move a window around. Whatever I’ve tried so far I can’t find a way to get this back. Does anyone know if its still possible to enable both gestures at the same time? Thanks. I’ve got exactly the same problem, and I cannot find the way to have both at the same time in Yosemite. Can someone help ? Thanks !! I enabled this on my MacBook Pro, didn’t like it, and now my three finger left-right swipe to move between desktops and full screen applications doesn’t work anymore. That stuff is in the “trackpad” window accessed from the main System Preferences window. I had the opposite problem — I enabled those gestures via Trackpad” and then couldn’t figure out how to turn the three finger drag back on. Never mind. I had to go SOMEWHERE else to get that back. It’s weird that everything to do with trackpad gesture configuration isn’t in the same System Preferences option. Hey Rex where did you have to go to get the 3-finger swipe back? I too did not like the loss of the 3-finger swipe for changing desktops but did not get it back after stopping the gesture for moving icons. Where did you go to get your three finger left-right swipe. I suddenly can’t use mine either. I despise ALL the Track pads and stick with a Track ball. Best controller type I have been using for around 30 years. Also I have a One finger gesture for all the interfering moves on the newer iOS versions that keep doing the wrong thing on my iPads/iPod Touch. My hand is too old and not as steady as when I was a KID. Turn them OFF ween I can, now if I could just Kill (forever) Notifications on the iOS devises, Apple Give me a Choice. I tried this trick, didn’t like it, and switched it off. But now my trackpad is ultra sensitive, something it wasn’t before. You probably adjusted the trackpad tracking speed settings. Re-adjust them to your prior settings. Tracking speed is in the Trackpad settings and in the Accessibility thing, Apple puts stuff all over the place with not much thought to it sometimes – design by committee is the norm in modern OS X and iOS, didn’t used to be that way! 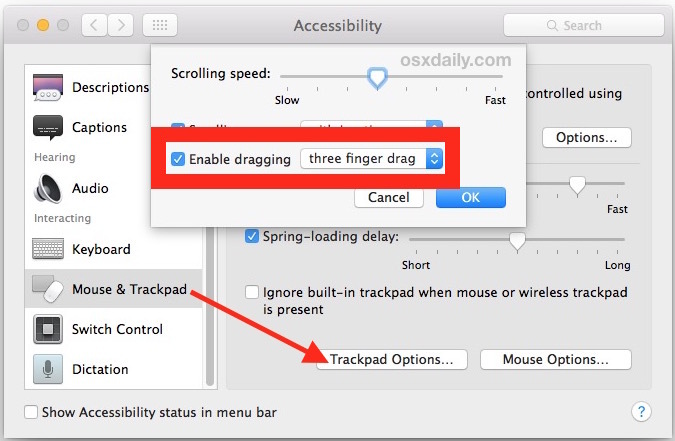 i don’t have the 3 finger drag option under trackpad options in accesibility. i only have the other two drag options. i AM running 10.11 on a MacBook Pro (15-inch Early 2008) and I have all other gestures that every other new trackpad has. any ideas? Talking about trackpad, I highly recommend BETTERTOUCHTOOL (https://www.boastr.net). I promise you will have much better use of your well loved trackpad. Free app by the way. You can assign that 3-fingers swipe! I never really post comments for things like these, yet, YOU HAVE NO IDEA how long i’ve searched to have this option again (i’ve had it before but for some reason it stopped working); so thank you, whomever you may be – much love! Thank you all (the article writer and the commenters) for this. Just an FYI for anyone for whom it isn’t clear (as it wasn’t for me): if you’re trying to turn three-finger space swiping on in El Capitan, it’s actually labelled as ‘Swipe between full-screen apps’ under Trackpad in System Preferences. Sadly, it took me several hours to figure this out. But now I have my three-finger swipe between spaces working on my new machine. Fixed! I enabled three finger drag in the Accessibility section then swipe with four fingers in Trackpad. Great! I spent a couple of hours struggling with this and found the answer here.